Many rappers have discussed your fate over spaghetti. Rappers want to be mobsters and mobsters want to be rappers. No? I think the phrase is rappers wanna be athletes and vice versa—but I digress. Rap’s infatuation with Italian gangsters is no secret; artists from both coasts have nicknamed themselves after famous mafiasos. There’s Young Gotti Kurupt Tha Kingpin from California, Capone from Queens, and let us not forget about NYC’s Wu-Tang Clan and their track “Wu Gambinos,” where each member gave themselves cool monikers. Names like “Noodles,” “Lucky Hands,” and the like are directly inspired by Jimmy Two Times in Goodfellas. Nas’ “Street Dreams” video was a play on Casino, another Scorsese vehicle. The Italian influence doesn’t stop there. For some reason, rappers love them some pasta—with an emphasis on spaghetti and fettuccine. So, we figured it would be cool to make a rap guide to pasta for all the hip-hop food obsessives out there. 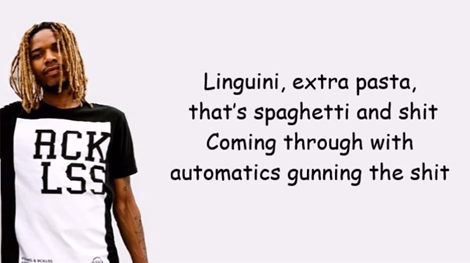 We included pasta references, videos, a song, a rapper, and a very dank meme. I’m not a foodie, but doesn’t “three-course meal” mean appetizer, main course, and dessert? This line birthed an awesome meme video. More on that later. Bronsolini has too many pasta references. Ghost is the best when it comes to food references because he uses them to paint a picture. A ravioli bag means a fat sack of weed. I have no idea what he’s talking about, but that line will always be dope. I think it means he will bake rappers like ziti with his raps. Drizzy’s been talkin’ slick as of late. Maybe because he’s been in the gym, and pasta is good for beefing up. The boy has been eating a whole lot of wheat pasta while watching mob flicks. Meek learned the hard way. Fettuccine (a.k.a., fetti) is a rap code word for money, for those who are unaware. “Fetti on Fetti on Fetti/I can’t go in I ain’t ready” is the hook. This new generation of rappers plan on keeping the pasta wave going and that’s a beautiful thing. That plate looks delicious, G-Dep. I hope he saved that fish head for soup later. Did Juelz ever get his pasta? He did eventually, but that wasn’t good enough, so he and Dips went for some lo mein after. Action Bronson cooking spaghetti and shrimp. This is the video I was referring to in the “Loose Yourself” blurb. You know you’ve made it in a genre when you turn into a meme. If spaghetti were a person, it would be very proud of this recognition.